Narrated the audio book of 'The Holy Mark', written by New Orleans author Gregory Alexander. 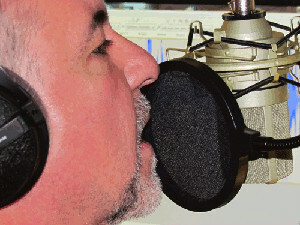 Volunteer reader for WRBH 88.3 FM, Radio for the Blind and Print Handicapped in New Orleans, Louisiana, USA. I have a lifelong desire to do cartoon voices. It's not all I can do, so please give my demos a listen to hear some of my other talents. I think you will enjoy them. I'd love to change this section to feature the job that you hire me for. Please consider me if I am right for your voice over project. 2 day New Orleans NOLA Voice Talent Foundation, Inc. Summer Voice Over Seminar sponsored in cooperation with Voices Voices. Demo recording session with Mike Ziants (McCann), producer/engineer extraordinaire of Airlift PROductions http://airliftproductions.com/Homepage.php, New Orleans, LA. I am always willing to learn something new especially in the computer, tech, recording, gadget realms. I've always loved recording gear from reel-to-reel tape to DAWs. The first time I met with my producer Mike Ziants (McCann) and saw how completely and awesomely he had outfitted his studio, I knew this was a business I had to be in. When I walked into the NOLA Voice Talent Seminar and was handed a copy of the latest Sweetwater catalog, my knees got weak. I love gear and more importantly for you, I love what can be done with it.